This is common to all blind singers, but this time, I can say that this is unique from others, specially on how she read the lyrics, she really has a good voice. 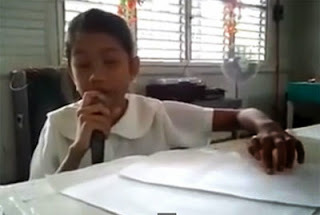 The 11-year-old blind Pinay singer named Joyce Jimenez is now trending online. She covers the latest hit song of Miley Cyrus - "Wrecking Ball." While singing, she read the lyrics using braille. The grade 5 student from the Governor Generoso, Davao Oriental, was the center of attraction whenever there's an event in their town. According to ABS-CBN News, Joyce Jimenez is preparing for her TV debut, she become popular and might perform in local talk show and abroad someday. Maybe one of this day, the 11-year-old blind pinay girl will visit the popular U.S talk show, "The Ellen DeGeneres Show," according to report. God Bless You more Joyce Jimenez and more more blessing to come in your life and family. For the meantime, please bookmark this page now or visit this site more often for you to be updated. You may also share this post to your friends so they may know about Blind Pinay Singer. Comments or suggestions about "Blind Pinay Singer covers 'Wrecking Ball' by Miley Cyrus goes viral (Video)" is important to us, you may share it by using the comment box below.